Shocking titles tend to get clicked more on Facebook. So if I wanted more clicks, I probably could have gone with a sensational title like, “The market is taking a turn downward”. Or maybe I could have said, “Big changes you MUST know about in Sacramento real estate.” After all, the stats are showing values are softening, so hyping up this point could certainly lead to more traffic. But you know what? I’m not interested in hype, and I never want more clicks at the expense of my integrity. Yes, the market is growing softer right now, and that can feel scary for some, but truth be told there really isn’t any shock here because this is exactly what we expect to see happen during the fall months. Nonetheless, the fascinating part is the fall season this year has still been different than it was last year. This year is actually much more competitive and far less dull. So let’s unpack some trends below with the goal of understanding what values are doing so we can more effectively tell the story of the market to our clients and contacts. I hope this is helpful for locals as well as out-of-town readers (what is your market doing right now?). DOWNLOAD 70 graphs HERE (zip file): Please download all graphs in this post (and more) here as a zip file (or send me an email). Use them for study, for your newsletter, or some on your blog. See my sharing policy for 5 ways to share (please don’t copy verbatim). Thanks. One Paragraph to Describe the Sacramento Market: The market has been slowing in the Sacramento area, but it’s nowhere near as slow as it was last year at the same time. Overall sales volume is up nearly 11% in the region this year, housing inventory is down 24%, and homes took 4 fewer days to sell this September compared to last September. There have actually been less price reductions so far this year too. In terms of home prices, the median price, average price per sq ft, and average sales prices are tending to be about 4-5%+ higher than they were last year, though this doesn’t mean values are necessarily 4-5% higher. This is an important distinction because median price increases don’t always translate dollar to dollar to actual value. 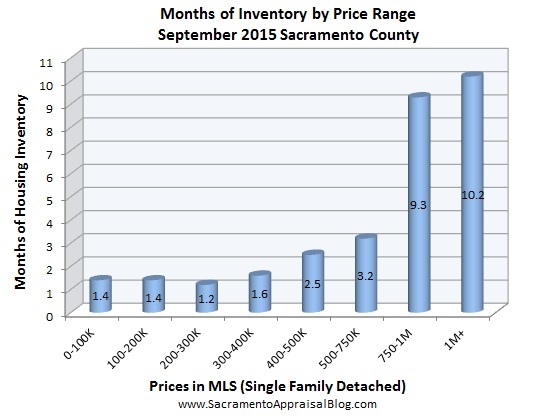 Keep in mind the median price in the regional market has softened by almost 2.5% over the past few months, and the median price in Sacramento County has been about the same for five months in a row. There are some graphs below to help show the seasonal market, and they remind us it is customary to see the median price soften, inventory increase, and sales volume decline during the fall months. Overall there is still a higher demand than there was last year, but the market is very price sensitive. Buyers simply aren’t pulling the trigger on overpriced homes (sellers, please consider that). By the way, if you missed my post last week, I gave some perspective on “real estate bubble” conversations, and it is a very relevant post as we see price metrics begin to soften at this time of year. The median price has been hovering around $290,000 for 5 months (3.6% higher than last year). It took an average of 36 days to sell a house last month (up 2 days from the previous month). Last year at this time it was taking an average of 41 days to sell a house. 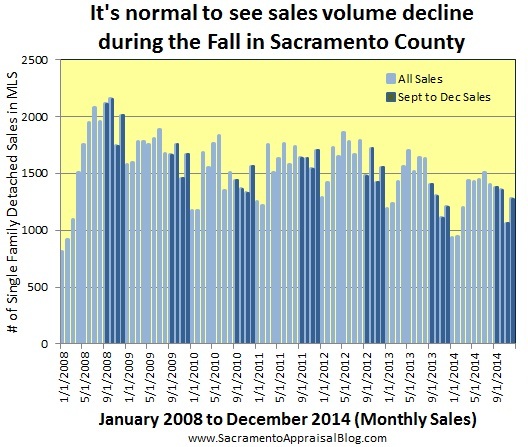 FHA sales were 29.5% of all sales last month (nearly 28% of all sales in Sacramento County last quarter). Sales volume is 10.1% higher so far in 2015 compared to last year. Sales volume was 13% higher in Sept 2015 compared to Sept 2014. There is a 1.74 month supply of homes for sale (similar to previous month). Housing inventory is nearly 30% lower right now compared to Sept 2014. The average price per sq ft is 188 (5.6% higher than last September). The average sales price is $314,317 (1.9% higher than last September). Sales volume was up 11.5% in Sept 2015 compared to Sept 2014. Sales volume for the year is up 11% compared with 2014. The median price at $325,000 is up 4.8% from last year, but down 2.5% from the past few months. It took an average of 41 days to sell a house last month (2 days longer than last month). There is 2.06 months of housing inventory (same as previous month). The average sales price is $360,481 (4.3% higher than last year, but down slightly from three months ago at $370K). It took 4 less days to sell a house this Sept compared to Sept 2014. Housing inventory is nearly 24% lower right now compared to Sept 2014. Sales volume was up 7.7% in September 2015 compared to September 2014. Sales volume for the year is up 15.8% compared with 2014. The median price in Placer County is $389,000 (about 1% higher than last year at the same time). Cash sales were 18.8% of all sales last month (very normal level). It took 46 days on average to sell a house last month (same as previous month). FHA sales were 16.7% of all sales in Placer County last month. There is 2.42 months of housing inventory (17% lower than last year). The average price per sq ft is 194 (5.3% higher than last year at the same time). REOs were 2.6% of all sales and short sales were 1.5% of all sales last month. It’s normal for prices to cool during the fall. This year the market is not as soft as it was last year at this time, but we are still seeing a softening. Price according to the most recent listings that are actually getting into contract rather than the highest sales from the spring. Talk about the difference between actives, pendings, and neighborhood sales on your listing appointments and in your appraisals. See How to use a CMA to gauge the temperature of the market for a fantastic way to quickly explain what the market is doing to your clients. The market is price sensitive, which means buyers are not biting on overpriced listings despite inventory and interest rates being relatively low. Not sensational, but fairly normal. That’s a great way to describe last year’s real estate market in Sacramento. There was a nominal uptick in value during the first part of the year, but otherwise values were very flat. Let’s take a look at the year as a whole below and delve into some December trends too. Email me for the graphs: If you would like all the graphs in this post (and many more), send me an email. You can use these in your newsletter, some on your blog, and some in other social spaces. See my sharing policy for ways to share. 4) Sales volume was down 7.7% in 2014 compared to 2013. 5) FHA sales increased by 11.3% from 2013. 6) There were 38% less cash sales this year. 7) Short sale volume was down 64% from 2013 level. 8) Bank-owned sale volume was down 18.9% from 2013. How much did values rise last year? The median price increased 6% from December 2013 to December 2014, the average price per sq ft increased by 3.5%, and the average sales price increased by 4.5%. It’s easy to look at the median price at 6% and think, “Sweet. Values increased by 6%”, but an increase in median price at 6% doesn’t necessarily translate into an actual 6% boost in value to every property. When we look at other metrics such as price per sq ft and average sales price, those metrics are even lower than 6%. All things considered, the actual increase in value was modest at probably 3-4% at best. Housing inventory was flirting with 2 to 2.5 months for much of the year. This means there were generally 2 to 2.5 months worth of houses for sale at any given moment. The peak was 2.75 months in November, and the low was last month at 1.79 months. Remember, inventory almost always declines during December, so don’t make too much of the low number (it doesn’t mean buyers flooded the market). During November and December people tend to be thinking of turkey and gifts instead of real estate, so it’s not a huge surprise to see sparse inventory. Moreover, it’s natural to see a lower inventory right now since many owners do not want to list their properties until February or March when the market begins to heat up. As January unfolds though, listings are slowly starting to come back on the market. 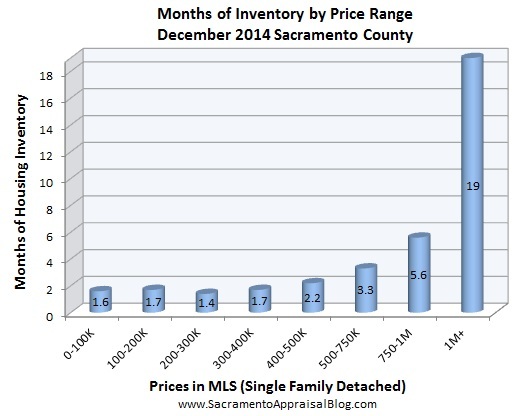 As you can see, inventory is not the same at every price level, and it was very low in December other than above the $1M range. Sales volume was down by 7.7% this year, which translated to 1,310 less sales on MLS this year compared to 2013. As you can see by the graphs above and below, volume this year was much lower than previous years. There were more sales in December than November, but that’s not a surprise since November had a sluggish sales volume (and December often has more sales than November, but technically many of these sales got into contract in November). FHA has been making a big come-back in the market. Why? There are less cash investors, and FHA has been one of the strongest options for many buyers trying to purchase with little money down. This year FHA sales represented about 24% of all sales, whereas last year FHA was just under 20% of the market. Remember that FHA used to represent over 30% of the market from 2009 to 2012, so there is room for continued FHA growth. This year there are bound to be some more competitive conventional products hit the market, and the 90-day flipping rule will thwart some FHA buyers, but otherwise FHA should still be a relevant force to reckon with in housing in 2015. It’s easy to get alarmed when prices soften during the Fall, but that’s normal. There are simply fewer sales, and inventory tends to be a bit higher too. Having 38% less cash sales in 2014 made the market feel a whole lot different than 2013. This dynamic really cooled off values and brought about a more “normal” feel. 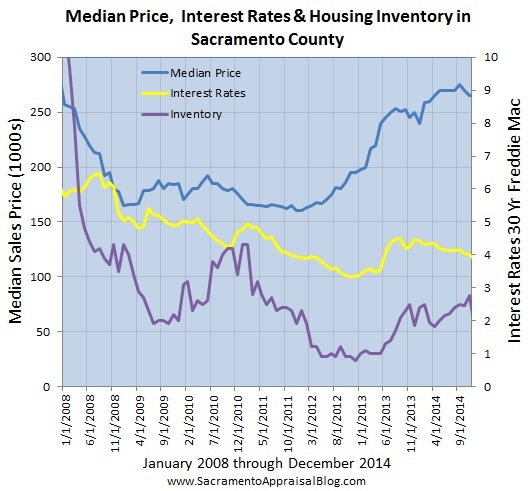 In 2012 and 2013 there was an extraordinarily high level of cash investors playing the market, but without the investors this year it gave us a picture of what demand really looks like in the Sacramento market. It’s a healthy sign to see more conventional sales this year too compared to 2013. I mentioned above that having less investors has helped FHA buyers get into contract more often, and these graphs really prove the point. The same is true with conventional and VA buyers. This past year owner occupant buyers were actually able to get into contract without having to try to outbid investors with deep pockets. 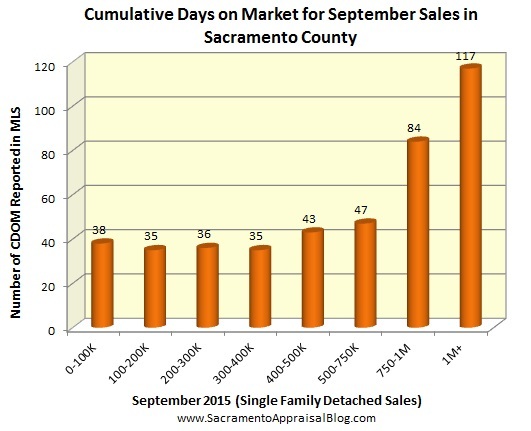 It took 50 days on average to sell a home last month in Sacramento County, which is 20% longer than it was taking one year ago (40 days in December 2013). Keep in mind it was taking easily 80-90 days at the end of 2011 and beginning of 2012, which was only three years ago. Ultimately well-priced properties are still selling very quickly and receiving multiple offers in some cases, but properties that are overpriced are sitting on the market. This is the classic example of what Jay Papasan says about “being on the market” vs. “being in the market”. Both short sales and REO sales hovered around only 6% of the market for the past two quarters. There are still distressed sales to buy out there, but they are far and few in between. All the experts keep saying rates are going to increase, but then the Fed keeps surprising us with lower rates. Obviously this cannot continue forever, but for now lower rates are going to help buyers afford more house for their money (and afford to purchase in a market with higher prices). Three factors to watch this year include interest rates, the health of the local and national job market, and housing inventory. These are three of the biggest players in the market right now since cash investors and freakishly low housing inventory are no longer driving factors. a) Interest Rates: Rates moving up and down will impact values to a certain extent as buyers will be able to either pay higher prices or not. b) Job Market: Our economy has been inching forward, but we need local buyers to have higher incomes. Relief at the gas pump will certainly help free up some funds, but that is an external temporary boost for buyers instead of wage growth. c) Housing Supply: Inventory has been flirting with 2.5 months, and it was poised to grow this coming year (but we’ll see what lower rates do to inventory as more buyers may enter the market). 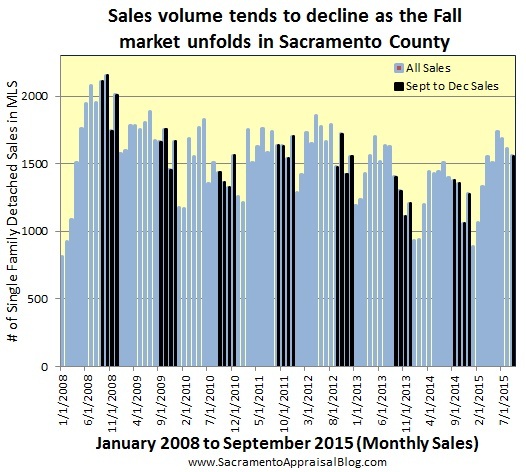 Remember that the market in Sacramento showed declining values any time in the past 15 years when inventory was higher than 4 months of housing supply. We like to say “5 months is a normal supply of houses”, but that’s not the norm for today’s market. In short, let’s keep our eye on how high inventory goes because the market is very sensitive to increases in inventory. Questions: How would you describe the market in 2014? Anything else you’d add? 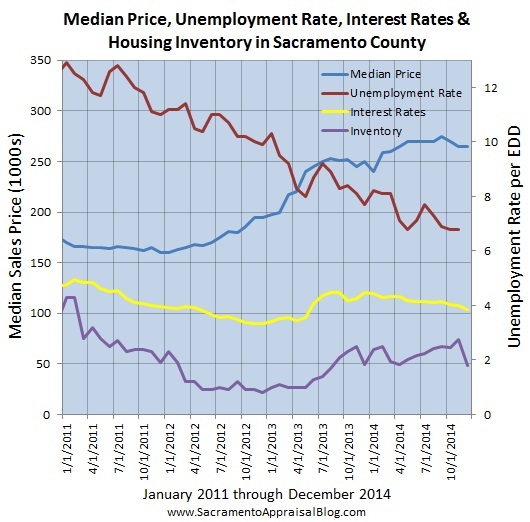 If you are not in Sacramento, are there some similarities here that also resemble your market? I’d love to hear your take.